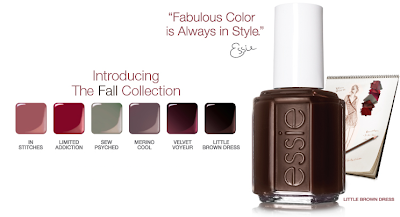 I am getting excited about all the muted dark and striking bold shades as fall is approaching. Essie will launch its fall 2010 runway-inspired collection starting from September 1st in the US. The collection consists of 6 shades in rose, red, mauve, purple, dark chocolate and muted green tones. Check out Makeup and Beauty Blog for close-ups, swatches and the review of this collection.